I am thrilled to announce the publication of my new book: LA PASSIONE: How Italy Seduced the World. Like any author, I’m eager for people to read my book. But with more than 8 million titles on Amazon alone, why choose mine? Let me offer seven reasons, based on my discoveries as I traveled through Italy in search of la passione italiana. The lace-makers of Burano who saved their island from starvation, stitch by stitch. The ghost of the young Florentine who escaped from her tomb to “live twice” with her true love. The history of Neapolitan pizza. The singers, castrated as boys to preserve their high voices, who sublimated passion into song. Wine from a vineyard on an Umbrian hillside cultivated since centuries before Christ’s birth. Hand-made chocolate confections invented in Perugia by clandestine lovers. Balsamic vinegar aged in Modena for more than sixty years and drizzled over gelato. Passatelli, a pasta of cheese and breadcrumbs that I learned to make in a Bologna kitchen. An Italian-American woman’s inspiring campaign to save an abandoned chapel in the Tuscan town of Castiglion Fiorentino. Sleek road rockets and the roar of their engines at the Ferrari museum in Modena. Heart-shaped balloons on Valentine’s Day in Verona, home to Shakespeare’s Juliet and her Romeo. Moonlight in Venice and fireworks over the Bay of Naples. La passione italiana imparts simple but profound life lessons: Hold family close. Appreciate your senses. Cultivate compassion. Share food and laughter with friends. Honor the sacred. Choose the bello over the brutto. Love without limits. Let the human spirit soar. Whether or not you are Italian by blood or aspiration, have visited or dream of visiting Italy, love pasta and pizza (and who doesn’t? ), let yourself by seduced by a passion that resonates in all our souls. I look forward to sharing my Passione with you! 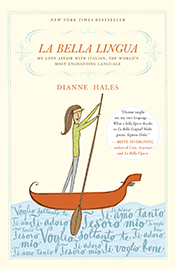 Dianne Hales is the author of LA BELLA LINGUA: My Love Affair with Italian, the World’s Most Enchanting Language, MONA LISA: A Life Discovered and LA PASSIONE: How Italy Seduced the World. For more information on her and her Spring book tours, visit her website: diannehales.com. As of the end of April, I will not be posting at “Becoming Italian Word by Word.” Instead, I am debuting a new blog, "A Passion for Italy," which will be available on my website, along with a complete archive of my previous posts. To subscribe, click HERE, and go to the top of the sidebar. If you are already subscribed via e-mail to my Typepad blog, your subscription will automatically transfer to the new blog. However, if you subscribed via RSS, you will need to do so again, using the same link as above. Italy has been seducing foreigners since its history began. Century after century, in peace and war, over perilous passes, stormy seas, and rutted roads, they have come—explorers, adventurers, traders, sailors, soldiers, writers, musicians, poets, painters, sculptors, penitents, pilgrims of every sort—to the promised land of their imagination. From Boston to Berlin, Sydney to Singapore, people nibble on biscotti, sip capuccino, drive Fiats, stream Italian films, and zip up Diesel jeans. The Mediterranean diet—practically a synonym for the cooking of southern Italy—has won over legions of fans and foodies. Even mainstream supermarket chains stock Italian pasta, olive oil, Parmesan cheese, and peeled tomatoes. Italian fashions have become just as ubiquitous. The upscale salons of big-name designers line the chicest shopping streets of major cities on every continent. The “Made in Italy” label lures millions of customers with a sophistication that blends elegance with exuberance. At the heart of this culture pulses la passione italiana –- especially when it comes to matters of the heart. Imbued with its fire, we might all become as brave as Italy’s gladiators, as eloquent as its poets, as alluring as its beauties, as beguiling as its suitors. At the very least we can savor more fully the greatest of Italian passions—for life itself. What could be more seductive? Read more in my new book: LA PASSIONE: How Italy Seduced the World,available to preorder here or on sale everywhere April 16. Passion Sunday, the fifth Sunday of Lent, marks the beginning of a two-week period sometimes called Passiontide. The early Christians fashioned the word passio from passus, the past participle of the Latin for "suffer." I never fully comprehended this meaning until I went to Sicily for Holy Week. Every year the ancient port of Trapani brings the Passion of Christ to life in La Festa dei Misteri (the Feast of the Mysteries). Over the course of twenty-four hours, a parade of massive altars, each depicting a scene of Christ’s final days, winds through the town’s narrow streets. The altars, fashioned in elaborate detail in the seventeenth and eighteenth centuries, have survived floods, fires, and Allied bombings in World War II. Squads of muscular men grasp one another’s shoulders, pressing close into a crosshatch of intertwined arms as they hoist each tableau aloft. Sweating and grimacing, they weave in a wavelike rhythm called the annacata, stepping forward and back and side to side. Two white-haired widows standing next to me provide a running commentary. The men move like the sea, surging in and out with the tides, one explains. The other insists that the rhythmic dance started because the porters drank so much along the route that they staggered, dropping an altar on more than one occasion. As day darkens into dusk, I find myself swept into the procession. When I try to break away, I hear voices calling “Guarda! Guarda! Guarda!” (Look! Look! Look!). Just turning a corner, a little girl, caped in black, leads dozens of mournful women carrying candles and rosaries. Inching its way behind them is yet another altar with a single regal statue: La Madonna Addolorata, the sorrowful mother of Christ, draped in velvet robes. A silver heart gleams in her chest. Above it—suddenly lit by a ray of the setting sun—flashes a sword. This is a Sicilian mother, stabbed by grief for her beloved child yet standing strong and resolute. Finally, on Holy Saturday, the altars make their way back inside their home church. The parish priest gives thanks to the people of Trapani—for their labor, their time, and, above all, their inspiring passion. On Easter, I once again hear a marching band and rush outdoors. At the end of a sun-dappled street, I behold an altar with the risen Christ, tall and triumphant, surrounded by lilies, carried by a fresh crew of burly porters. The crowd cheers. Steeple bells ring. I breathe in the scent of spring flowers and candle smoke. The faces around me glow with jubilation. When I join the parishioners admiring the altars on display, a young priest asks what I thought of the procession. Indeed it is: the great love that conquered the empire that had conquered the world and gave rise to the largest religion in history. And it is love that we find at heart of every Italian passion. Dianne Hales is the author of LA BELLA LINGUA: My Love Affair with Italian, the World’s Most Enchanting Language, MONA LISA: A Life Discovered, and the upcoming LA PASSIONE: How Italy Seduced the World. For more information on her and her Spring book tour, visit her website: diannehales.com. I didn’t have a clue. I had never set up a website, written a blog, created a Facebook group, or composed a single tweet. All that changed ten years ago when I prepared to launch my first Italy-themed book. La Bella Lingua: My Love Affair with Italian, the World’s Most Enchanting Language attracted readers around the world, earned for me the great honor of being knighted by the President of Italy, and garnered a spot on the New York Times best-seller list and as the subject of a Times acrostic. The companion blog that I created — "Becoming Italian Word by Word" — also took on a life of its own, attracting almost two million visitors and winning a “blogger of the year” award for “Best Arts and Cultural Blog” from Italy magazine. Over the last decade readers have come from just about every country -- Italy, England, Ireland, Poland, China, India, Japan, Australia, Samoa, Russia, Morocco, Germany, Brazil, Chile. A woman on a ranch in South Africa wrote to say my blog had inspired a series of paintings of Italian gardens. A group of nuns doing missionary work followed it regularly. Many teachers used the blog to spark conversation in class. One woman translated and read each post to her blind elderly brother, who had been born in Naples. To all my readers and followers, grazie di cuore. I thank you from my heart. But after a decade of focusing on words and expressions in la bella lingua, I am changing gears. As of the end of April, I will not be posting at “Becoming Italian Word by Word.” Instead, I am debuting a new blog, "A Passion for Italy," which will be available on my website, along with a complete archive of my previous posts. To subscribe, click HERE and go to the top of the sidebar. If you are already subscribed via e-mail to my Typepad blog, your subscription will automatically transfer to the new blog. However, if you subscribed via RSS, you will need to do so again, using the same link as above. My new blog will go beyond the pages of LA PASSIONE: How Italy Seduced the World to present more interviews with passionate Italians and more descriptions as well as photographs of the people I met and the places I visited. I am excited about sharing the backstories of my research with you, and I hope you enjoy discovering more about the Italian passions that seduced the world. 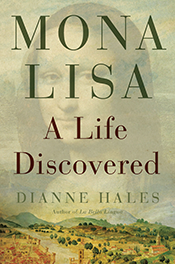 Dianne Hales is the author of LA BELLA LINGUA: My Love Affair with Italian, the World’s Most Enchanting Language, MONA LISA: A Life Discovered, and the upcoming LA PASSIONE: How Italy Seduced the World. For more information on her and her Spring book tours, visit her website: diannehales.com. I accepted the compliment without fully comprehending its significance. Passion, after all, can bloom anywhere. Think of France, with its culinary cathedrals; Spain, with its bullfights; Argentina, with its tango—not to mention the millions of soulmate seekers pursuing passion online. Yet these pursuits now strike me as mere imitations. How could it be otherwise? 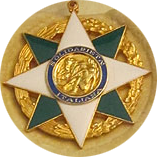 The original, including the word itself, was made in Italy. In the first century AD, newly minted Christians, constructing a vocabulary for their fledgling religion, chose the term passio for the agony that Jesus endured to redeem a world of sinners. Etymologists trace its roots to the Latin passus, past participle of pati (to suffer), inspired by the “sacrificio di Cristo e a quells dei prima martiri” (the sacrifice of Christ and that of the first martyrs). Although modern English-language dictionaries acknowledge the religious roots of “passion,” they define it as a state or an outburst of strong emotion, intense sexual love, or deep desire or enthusiasm. La passione is all these—and much more. The Dizionario Affettivo della Lingua Italians (Emotional Dictionary of the Italian Language) describes la passione as a flammable material—volatile and dangerous. When it possesses you, it causes infinitesimal, voracious particles to pulsate in the blood. You risk burning like a torch, flaming bright, and then disintegrating into embers. When you are inside la passione, nothing else can enter your mind. When it flees, you search desperately for more. Passion—and passion alone—lifts us above the ordinary. Without passion, there would be no literature, no art, no music, no romance, perhaps none of the wonders Italians have wrought. Beyond sentiment or emotion, la passione qualifies as a primal force of nature that cannot be ignored or denied. You will find more--much more--about this fierce drive to explore, discover, create, pursue beauty, and love and live with every fiber of one’s being in my new book, La Passione: How Italy Seduced the World. You can preorder it here or find it wherever books are sold on April 16. Dianne Hales is the author of LA BELLA LINGUA: My Love Affair with Italian, the World's Most Enchanting Language, MONA LISA: A Life Discovered and the upcoming LA PASSIONE: How Italy Seduced the World. For more information on her and her Spring book tours, visit her website: diannehales.com.